Inside you will find information on my three businesses, plus other associate businesses. 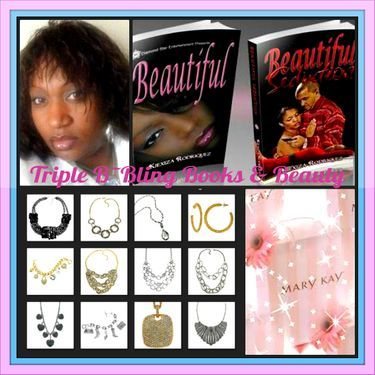 Triple B - Blingtastic, Bookalicious & Beautified. I'm not ashamed to say that I am not too happy with Corporate America. I don't HATE it. But, when you work FOR them, you are at their mercy, and you can be let go at anytime, without warning. Well, I finally said "NO MORE surprise pink slips!!!" I prayed, I talked with my family, and I chose to do something I that I love, instead of something JUST to pay the bills. Is it easy? NO. With a regular job, someone tells you what time to clock in, what time to go home, what you have to do, and you do it, for what they decide to pay you. THEY decide how much you can make. If you need more money, you seek out a 2nd job. Companies have a limit as to how much you can make within their company, in your position. If you want to take a vacation, you MIGHT be able to take time off, unpaid...and don't even think about a family emergency or getting sick, you might get fired for a child needing you to be home with them. So I prayed for an escape, a way to be around for my son, my daughter and be able to do what I love, while getting paid for it. Trust me it took a huge leap of faith and lots of focus. I have to push myself, motivate myself, set my own hours and my schedule. I have to tell myself when to get up, what to do and when to do it. But, the great part is I also tell myself how much I am worth. If ,y family want or needs more, I know I can work harder to get more. I know that the harder I work, the more my family is rewarded. I am actually rewared financially for my hard work!